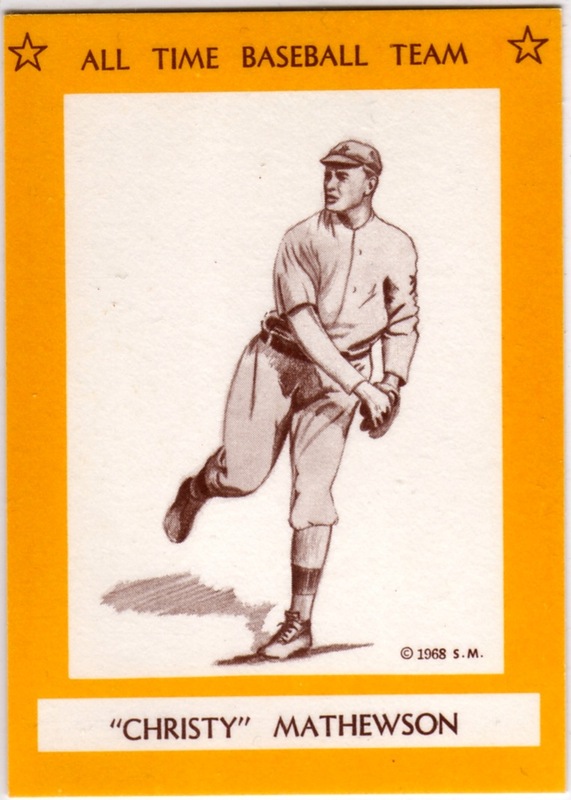 Today's set shows one of baseball's earliest hand-drawn, collector-made sets, as the suitably named Art Ouellette contributed his pencil-and-pen likenesses to 15 superstar players, posed within a bright yellow frame. 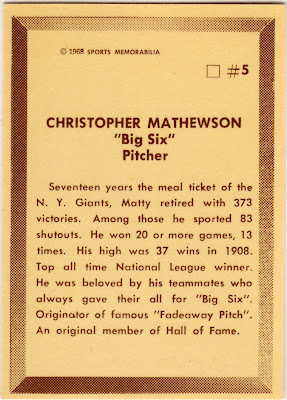 Christy Mathewson had already retired from pitching when the US entered WWI. He enlisted in 1918 (at age 38!) and joined a unit working with chemical weapons (such as mustard gas). Unfortunately for Mathewson, accidental exposure to the gas during a training exercise left him hospitalized and vulnerable to tuberculosis, which he contracted and eventually died of at age 45. Writer Damon Runyon crafted my favorite quote about Mathewson. "Mathewson pitched against Cincinnati yesterday. Another way of putting it is that Cincinnati lost a game of baseball. The first statement means the same as the second." The scan below (cribbed from eBay) shows a complete set, including its paper slipcover at upper-left. Bob Lemke's annual Standard Catalog called this one of our hobby's earliest direct-to-collectors issues, made by fans for sale to other fans. Sport Hobbyist magazine reprinted some Famous Baseball Cards for subscribers starting in 1963, but that's the only collectors issue I know that precedes this one. Let me know if you've seen a self-made set that's older! Value: Bought this #5 for under $5 on eBay. Bigger names like Ruth and Cobb cost a little more.